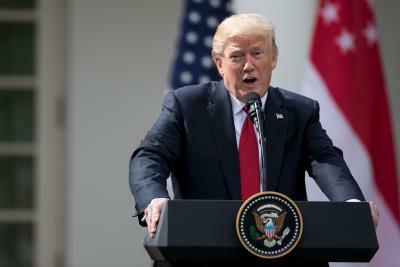 Washington, Oct 25 (IANS) Less than one-third of Americans support US President Donald Trump’s tax cut plan, a poll released by market and public opinion research groups showed. According to a Reuters/Ipsos poll released on Tuesday, of the adults who said they had heard of the tax reform, 28 per cent said they support it, while 41 per cent oppose it and another 31 per cent said they do not know, Xinhua reported. A budget resolution approved by the US Senate last week would add up to 1.5 trillion USD in fiscal deficit during the next decade, paving the way for Trump’s tax cut plan. The Trump administration, along with congressional Republicans, last month released a unified framework for tax reform, which will cut tax rates for businesses and individuals but lacks details about how to consolidate the fiscal position in face of big tax cuts. The US national debt is ballooning at over 20 trillion dollars, which is more than the country’s’s annual GDP. Independent analysts believe Trump’s tax cut plan would leave the debt even larger, while some Republicans are of the view the tax cut could be offset by stronger economic growth that would generate more tax revenue. According to the poll, more than two-thirds of registered voters said reducing the US federal budget deficit is more important than cutting taxes for the wealthy or for corporations. US House Speaker Paul Ryan on Tuesday said that House Republicans will unveil the long-awaited tax reform legislation next week and pass the bill by the Thanksgiving week. The poll, conducted online in all 50 US states, found that only 15 per cent of registered voters said the Republicans in Congress should prioritize tax reform over other issues.